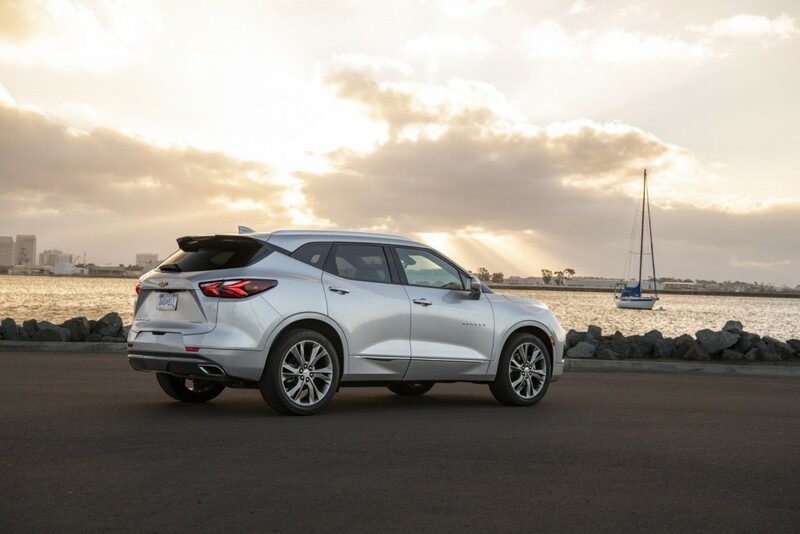 The 2019 Chevrolet Blazer should be reaching dealerships as you read this, and as the 2019 Blazer rolls out, the brand’s marketing director shared some insight into the mid-size crossover. Automotive News (subscription required) spoke with Chevy marketing director for cars and crossovers in a Monday report, and he stopped short of giving a sales target for the 2019 Blazer. However, he mentioned that he expects shoppers will cross-shop the model with Jeep Grand Cherokee, Subaru Outback, and Honda Pilot. He mentioned Jeep moves around 200,000 Grand Cherokees, but Chevrolet does not have exactly similar aspirations for the 2019 Blazer. Simply, the brand hopes by offering another crossover, it will capture more buyers that typically look at rival makes. Chevrolet purposefully shrunk the Equinox and made the Traverse larger to make room for the 2019 Blazer, after all. The lineup now directly matches Ford’s Escape, Edge and Explorer trio. Majoros also said we won’t see an advertising blitz start for the new Blazer until April of this year. It gives dealers time to absorb the effects on advertising and marketing the 2019 Chevrolet Silverado first. The brand kicked off a massive Silverado ad campaign last month as the trucks are now in plentiful supply and Chevy launches the final few cab and bed configurations. He said demand for the new Silverado has been “great” and “strong” so far. Back to the Blazer, Majoros did share that Chevy expects the majority of buyers to opt for the available 3.6-liter V6 engine over the standard four-cylinder mill. He didn’t expand on the comment, but internally, those are Chevy’s projections. And it looks cool when compared to a Nissan Juke! Lotta junk in that trunk, and no crease or line on the thing that doesn’t clash with something. Even Outbacks aren’t ugly anymore, what was the point the styling department was trying to make here? I thought the previous thread’s comments comparing it to the Grand Cherokee were uninformed but GM really sees it in the same class?! That’s funny. Like someone else said, maybe at $25k this “Blazer” might make a little sense. Given how desperate it seems GMA is to try and hard-sell these (almost everyday we have the same please-look-at-me-please-buy-me-please-please-please Red Chevy Blazer article), I do not hold out much hope for the Chevy Blazer. – Overpriced…are you kidding me, GM, almost $50K for this?????? – The competition is dug in and building great crossovers. And even crazier, Toyota and Honda are building crossovers in the good ol USA, better supporting the American economy than GM. – The depreciation on the Chevy Blazer will be horrendous…Quality not as good as the competition and made in Mexico wont help. Waste of cash. But it’s not $50K. It’s $50K for the top trim. Generally speaking, at a cost of $30K, it sounds like a decent go. Interior refinement is still below the competition even at that price point, but it has a polarizing exterior design and the reviews indicate it has a good ride and driving dynamics for the segment. Not quite Camaro. Not even Mazda SUV fun. But still. The problem I have is at the $50k price point. I watched a few video reviews on this car at the top trim price point, and there is simply too much hard plastic everywhere in the interior. At $50k, that’s luxury money. I expect most or all surfaces that are within my reach to be soft touch plastic. You can makeup a couple of hard plastic pieces with a stunning design. Hard to pull off but doable. A luxury nameplate with a gorgeous interior can pull it off. Not this, I’m sorry. The new 3-row Kia tops out at $50k and the exterior and interior design are superior. You get more for your money. The same amount of money, actually. At about $50k, I can step into a Jeep GC Summit. Jeep GC Overland is $45k. Both interiors are better than the Blazer and the current Jeep GC has been on the market for quite some time now. I’m tired of the excuses. Why is it so difficult for GM to spend the money and make the best interiors in the class? They can do it. But they won’t. I hope they wont’ cheap out on the interiors for this new EV platform. They make anything but a first-rate, class leading interior for the EVs and Cadillac might as well close up now and not wait. You’re not delivering the $29000 cars, everything on dealers lots is $41K and above. But even if there was a $29K car available that’s still overpriced. I paid 36k for my 51k Silverado. New. No one pays retail. I do wish they would just drop the price and lower the discounts, but the end result is the same. Blazer is at $35 k, did you say $50 k ? Good luck with that. So far the few I have seen are in the 45-52K bracket in V6 AWD RS and Premier trims. I think these prices are going to give people severe sticker shock, especially when most every competitor can be had for less. It will be very interesting to see how well these do end up selling and how much cash they need to put on the hood to keep up the momentum. Yeah, they’re overpriced but very good looking! Had they been built on the Alpha platform I would say there’s a clear comparison to the Grand Cherokee, but not as a Fwd/AWD. Needs a 3.6 Twin-Turbo performance package with 400 hp-395 lbft. For that kind of money the Blazer should be made in the U.S.. no excuses GM. Simply ridiculous excuses from GM management trying to justify why this is made in Mexico after GM terminated 15,000 workers (plus thousands more white collar ones just announced) in the U.S. and Canada. Honda, Toyota and many others are building plants in the U.S. and hiring Americans and Canadians and even selling at lower price points. There is absolutely no excuse why this cannot be made in the U.S., especially at closed plants. Of course Machete Mary and GM always have excuses for their failures. The Mexico thing will hurt sales. Under normal circumstances maybe not as much but we’re not in normal circumstances right now. And having the Bronco made in the US with more off road dna doesn’t help. I think beyond that though, the biggest issue I have with it is the start/stop can’t be turned off. If I were in the market, that would be an instant deal breaker. I can’t deal with it at any price point. But in the 40-50k range I’d absolutely refuse to put up with it. It is a good looking cuv though. It shouldn’t have been called Blazer but the damage is done. People are going to buy what they like. Made in xxxx doesn’t have a lot of meaning anymore. Otherwise we wouldn’t have iPhones or Samsung Galaxy X phones. Oh, really, arent you one of the ones who said Hillary had a 98% chance of winning? We all know how that turned out. Unfortunately, there are no iphones made in the US anymore- I believe Motorola was the last one. So consumers have no choice. Matt, “under normal circumstances”…Ummm, do you mean “normal” as in the American manufacturing base was being destroyed along with the high-value and high-paid jobs it created? Do you mean “normal” as in the Chinese were stealing our IP and engaging in unfair trade practices that were completed one-sided in their attempt to cover up their failed communist regime? Or do you mean by “normal” that America was being bled dry by the world while also relying on the American taxpayer to finance everything? You are right, it is not “normal” these days…America is back..manufacturing is back…unemployment is at the lowest level in history…wages are rising…America now has the best performing economy in the world…Thank God it is not “normal”…. Guess you haven’t heard that GM laid off 4000 employees on Monday. Unemployment is at its lowest, but these are LOW and MINIMUM WAGE jobs. Companies are not investing all that money that trump handed back to them in hiring high wage jobs, but rather they are using it to buy back their own stock. Carrier has moved its base of operations to Mexico, we continue to buy our steel from China and Korea. Shopping centers are closing , Sears is about to go under, GM and Ford are getting out of the car business and shuttering plants……. What planet do you live on…. ………….and the big news now is that we are going to be staring at a recession in 2020. You can’t hold onto your company when all you make is pickups and suv’s and people no longer want them. …..what happens to the economy when we have 175,000 shuttered gas stations and oil drops to $1.00 a barrel? I will NEVER buy any Car, truck, or whatever made anywhere else but the USA. How dare GM hire Mexican laborers at $3.75 an hour, with no benefits of any kind, and expect them to work 6 days a week because they can in Mexico, at the same time they are shuttering factories in the US and laying off workers at a time when their profits are at an all time high………………..
Preach ! say it louder for Mary dumb a** , bad business move that’ll cost them many GM buyers , while Ohio plant sits empty when this could’ve been built in place of the Cruze but hey it’s gm don’t expect much anymore for them . Knowing that the Bronco is coming, GM could do themselves a favor by creating a ZR2 or Trailboss version of the Blazer. They could even call it Trailblazer. Again, GM would be leaving money on the table looking for offroad capability. Those customers will just go and buy a Passport, Cherokee, Bronco, etc. Starting at $28,800 by me. Should sell like Hot Cakes. Folks if you think $50 k is a high end luxury price you have not purchased avehicle in the last 10 years. The average price of a vehicle sold today is nearing $40k and $50k is just low end luxury and high end value models. True luxury is now over $70k and up. Second a Blazer at $50k will be had at the dealer for low $40k to $39 k based on deal I see for Traverse models. Some of you are just looking for ways to hate based on union alliances, Pure GM hate and or just ignorance. You may fool some but most informed people here are not fooled. Is the Blazer a perefect vehicle no as there are things that need addresses. But yet it will still sell well and better than the Impala by at least 3 to 4 times better and still make a good profit.. Finally 89% of the people will not know where it is made even less will care. So stop the the claims as every vehicle accept the Aztek built in Mex has sold very well. Where are the option boxes for the L86 EcoTec 6.2L V8 or 1LE suspension especially if General Motors wants the Chevrolet Blazer to be sold as a sports truck like the GMC Jimmy Typhoon as having the 3.6L DOHC-4v V6 isn’t enough to differentiate the Blazer from a number of GM CUV with essentially the same engine and suspension option as sheet-metal isn’t enough because imagine selling a Camaro without a V8 option. 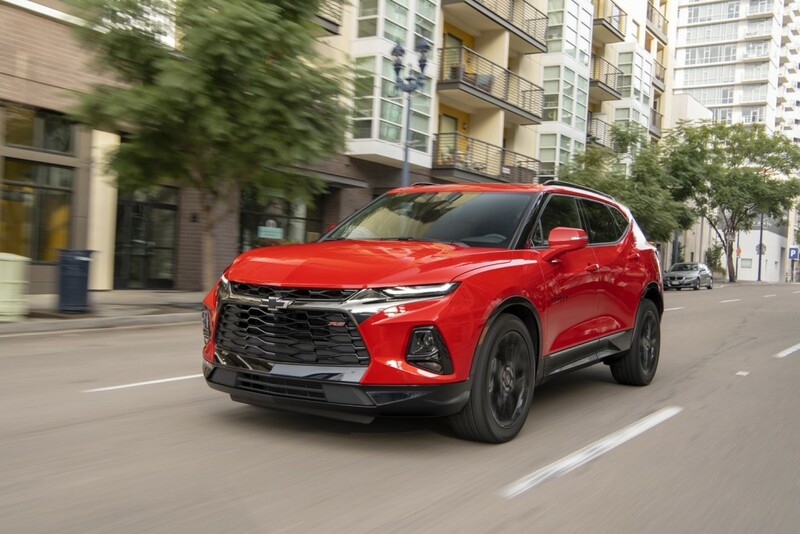 2019 Chevy Blazer Prem. should Top-Out at $40,000. This vehicle mass produced IN MEXICO can only cost $10,000 – 15,000 at the most. GM is trying to get away with HUGE profits. Like someone above said already$40,000 – $50,000 is LUXURY territory. TOO MUCH plastic and generics for a BIG PRICE. The prices are not that high. They are exactly in line with the Ford Edge and other mid-sized 5 passenger CUVs. FCA products like Grand Cherokee have higher cost of ownership and time spent in the shop compared to GM, so your savings initially will not last. GM will likely discount the crap out of these to move volume once the plants get up and running at full capacity. I bet one year from now you’ll be able to drive off the lot in a nicely optioned LT model for 35-37k, which is squarely in the “reasonable” category, for me. But, hysteria sells magazines and gets clicks. The GM haters will continue the mantra of “hard plastics and made in mexico, for 50k” but, out in the real world of working people with families, hard plastics mean cleans easily and stands up to abuse, and still looks good in 10 years (because they keep their cars for a long time). My biggest problem with the Blazer is they should’ve put the 2.7L turbo in it with a manual gear box. If you are going for stylish sports SUV, why not just go all in? Nothing like setting high standards for yourself. Heaven forbid GM come up with a vehicle they cannot actually make enough of. Mistake to benchmark Blazer against any Jeep product. Chevrolet and GM are clearly chasing VW globally and both Hyundai and Honda domestically. The era of Chevy, Ford & Chrysler (Fiat) being crosstown rivals aside from trucks and muscle is over. GM’s major market is China and this makes for a less “tough” line up and image. I think GM should use GMC for this seeing as it’s a regional brand that can use the Cadillac parts bin. All the auto manufactures are banking on financing to sell these overpriced vehicles. Most people who buy a car/truck/SUV are interested in the monthly payment……….so, how about a 10 year loan and happy motoring! I’ve been Equinox shopping………$40K with a $2500 rebate……….are you kidding me. Honestly, I hope GM goes bankrupt………and they move their headquarters to MEXICO!!!! They are a Global Anti-American Company………….face it! An Equinox starts at ~ $25k. If you happen to option the car up to $40k with a $2500 rebate that’s on you. If you’re going to option up the Chevy you might want to look at Cadillac. And XT4 will be cheaper than that if you don’t option it up as well. But the base options on the Cadillac will be a mid level Equinox. I don’t think global means a to-American. We nead a government that doesn’t allow or penalizes companies that outsource. From FDR until Carter high corporate and marginal taxes were the norm. We should ad to this a location tax that gives incentives for US production. Made in Mexico doesn’t bother me because of NAFTA but Mexico’s non union workforce is a real problem. Americans hate unions not realizing that they provide a benchmark for income and protections. CEOs work for stockholder, not workers.